The VDMWC2 is a versatile mount designed for ceiling and wall applications for the fixed vandal domes and mini-PTZ models. The mount features TMW a cable feed-through hole to conceal the video and power cabling. The total drop down length is 15.5” using the straight pendent ceiling mount. 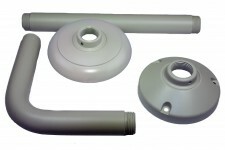 The total drop down length is 10.2” with a wall offset of 8” using the 90° bent pipe for wall mount configuration. Accommodates most exterior vandal fixed domes and Mini-PTZ domes.